Most engineers and other people in industry have heard of t-slot (80/20, MayTec, Bosch Rexroth, etc) aluminum. It’s kind of like a grown up erector set, made of extruded aluminum and brackets. You can make just about anything out of it from industrial equipment enclosures to XY plotters to furniture. While is it well suited for these large applications it’s over sized for most smaller DIY type projects. This is where MicroRAX comes in. 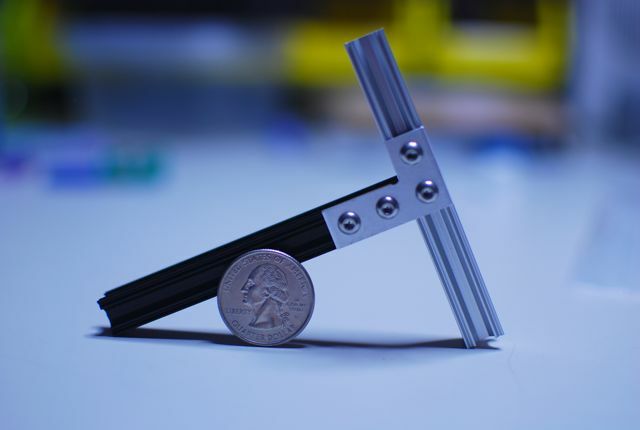 They supply a miniature version of t-slot measuring just 10mm x 10mm. I recently learned about this products and requested a sample of their beam kit. 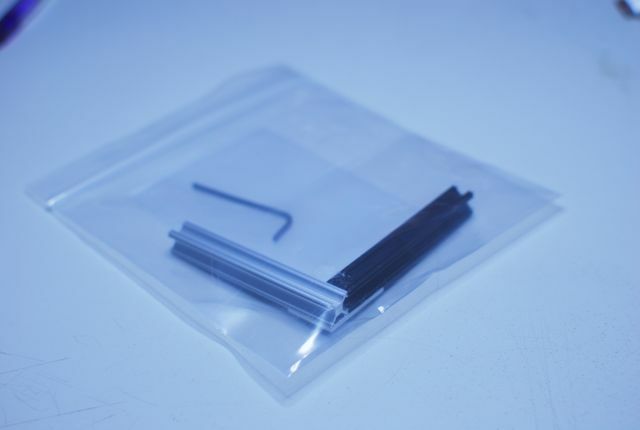 What I received was 2 small pieces of aluminum beam, a right angle joint with hardware, and even a small hex key. If you ever have seen full size t-slot you will notice jut how small mini t-slot really is, as such you would not want to build anything that carries a significant load (I would say less than ~30lbs). Here’s a picture of the beam with a US quarter for scale. 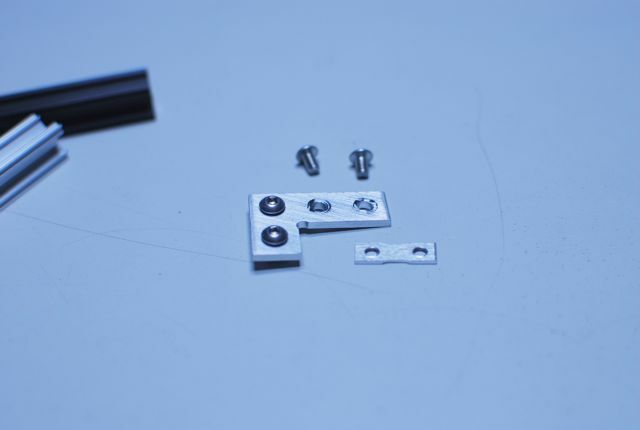 The joints are very similar to full size t-slot construction, consisting of a main plate, screws, and a smaller backing plate. The included right angle plate is made from 2.5mm aluminum, and the screws are button head stainless steel. The joint slides along the beam so repositioning is a snap. The beams are made of an extruded aluminum of unknown alloy (MiroRAX doesn’t list this on their website.) Being aluminum it is very easy to cut to length using simple hand tools like a hand saw, or even better a miter saw. The actual beam costs less than $9 for a 3ft length, and you will need the associated hardware as well. Building your project from mini t-slot has numerous advantages over other methods of construction. It’s fast – You can go from drawing to actual device very quickly. 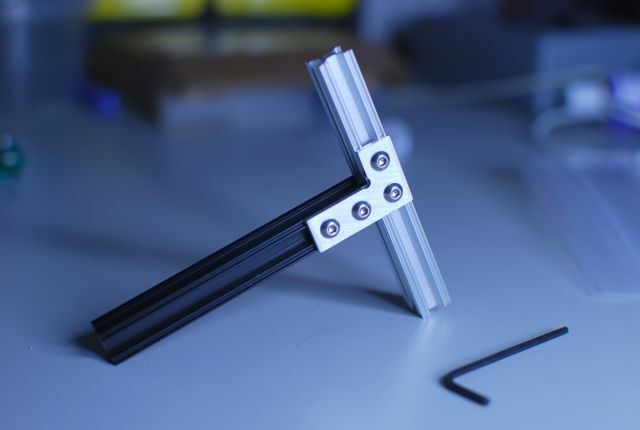 It’s reconfigurable – Decide that you want your robot to have 8 legs instead of 6? It’s easy with t-slot. Rather than rebuilding your entire robot you can simply change 1 or 2 pieces and keep going. If you want to move a support brace just loosen the screws and slide it over. No re-cutting or drilling is required. 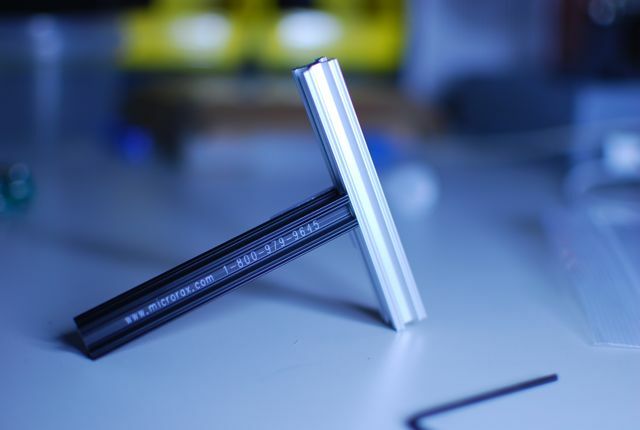 Does not require special tools – You can build just about anything you can image with nothing more than a pile of t-slot, a hacksaw, and a hex key. It’s reusable – One of the best reasons to use MicroRAX is that it is recyclable. 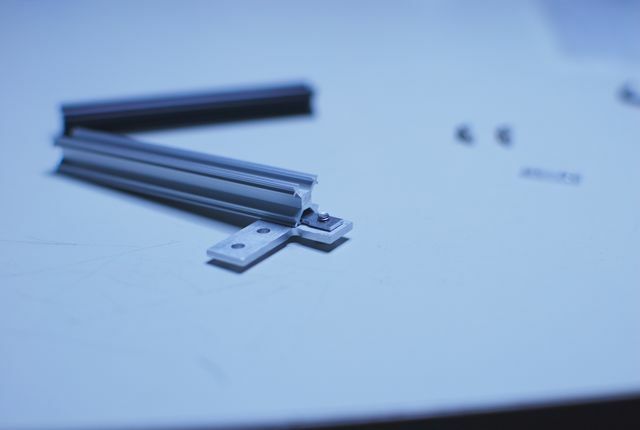 After you have finished a project using t-slot and decide you want to move on, you can disassemble it and reuse all the t-slot and hardware for your next project. Try doing that with water-jet cut pieces of acrylic! Note: In accordance with FTC guideline 16 CFR Part 255, I was not paid or compensated by MicroRAX for this review, while I did receive a free sample, this was not special treatment, as anyone can request the sample. Thank you for the post! The alloy is 6063-T6.